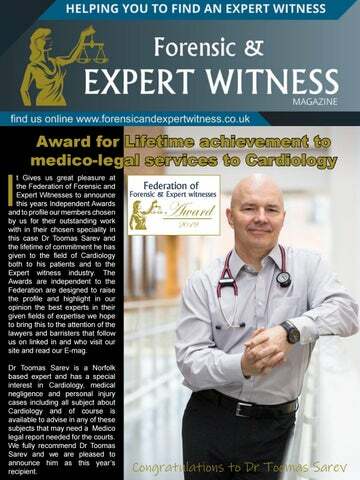 t Gives us great pleasure at the Federation of Forensic and Federation of Forensic & Expert witnesses Expert Witnesses to announce this years Independent Awards and to profile our members chosen by us for their outstanding work 2019 with in their chosen speciality in this case Dr Toomas Sarev andFederation of & Expert witnesses the lifetime of commitment heForensic has given to the field of Cardiology both to his patients and to the Expert witness industry. The Awards are independent to the Federation are designed to raise the profile and highlight in our opinion the best experts in their given fields of expertise we hope to bring this to the attention of the lawyers and barristers that follow us on linked in and who visit our site and read our E-mag. 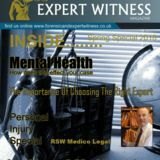 Dr Toomas Sarev is a Norfolk based expert and has a special interest in Cardiology, medical negligence and personal injury cases including all subject about Cardiology and of course is available to advise in any of these subjects that may need a Medico legal report needed for the courts. We fully recommend Dr Toomas Sarev and we are pleased to announce him as this yearâ&#x20AC;&#x2122;s recipient. Toomas is a Consultant Interventional Cardiologist in a role of Cardiology Service Director at NNUH, Norwich. He covers all aspects of heart-related problems in adults. He is mostly interested in ischaemic heart disease and coronary interventions. He works as an independent medico-legal expert. He is interested in cardiological issues related to clinical negligence and personal injuries. Toomas waiting time for the next medico-legal appointment is 1-2 weeks. Report completion time is 3-6 weeks depending on the complexity of questions and issues. Toomas keeps himself up to date with the CPR. To ensure the best practice as an expert he has attended the workshops arranged by Lynden Alexander and Giles Eyre via Professional Solutions Learning and Development at 12 Bloomsbury Square, London, a course of successful communication at experts’ meetings and preparing to give oral evidence in court and advanced workshop in writing expert reports in Jan 2017. My particular clinical interests involve performing these “slender” procedures via the wrist through small catheters using advanced methods - transradial PCI, invasive haemodynamics, pressure wire measurements, IVUS, OCT and rotational atherectomy. I graduated from the Faculty of Medicine from Tartu University, Estonia 1988 and performed further training in Internal Medicine and Cardiology at Tampere University Hospital, Finland. Between 1996-1998 I worked as a Consultant at the Intensive Care Department at Kuopio University Hospital in Professor Jukka Takala’s team. Toomas has done medico-legal expert training courses via specialistInfo.com at 218 Strand, London, led by the well known Jonathan Dingle and Judith Kelbie regarding the court room skills course and clinical negligence medico-legal course in November 2014. I took a refresher in medicolegal expert advanced training in September 2014 as well. After becoming a licensed Cardiologist in 2002, I was offered an interventional post in Stockholm, Sweden and between 2002-2010 I worked as an Interventional Cardiologist at Karolinska and Danderyd University Hospitals in Stockholm, Sweden. After that, I worked for four months at Emergency NGO at the Salam Centre for Cardiovascular Surgery in Khartoum, Sudan. Toomas is a member of the Norfolk and Norwich Medico-Legal Society and The Medico-Legal Society of London. I also subscribe to their journal and the Medical Law Review and The Federation of forensic and expert witnesses. I am a Member of The British Cardiovascular Society (BCS) and The British Cardiovascular Intervention Society (BCIS) and the European Association of Percutaneous Cardiovascular Interventions (EAPCI). I am a Fellow of the European Society of Cardiology (FESC) and International Associate Member of The Society for Cardiovascular Angiography and Interventions (SCAI). I am a Fellow of the Royal College of Physicians (FRCP) of London. Dr Toomas Sarev explains a little background to himself, I am a hard working Consultant Cardiologist. My specialities are heart-related diseases of adults and internal medicine. I have 16 years experience in interventional cardiology. I am best in performing angioplasties using balloons and stents to widen the blockages causing symptoms of angina. I am a great believer in Drug-Coated Balloons. Our team has achieved fantastic and inspiring results in that field. I have worked as a Consultant Interventional Cardiologist at NNUH since May 2010. That is a shared post; I also support James Paget Hospital with Cardiology services. In June 2017 NNUH appointed me as Cardiology Service Director. I am currently a student at Keele University, where my goal is to achieve Postgraduate Certificate in Medical Leadership. â&#x20AC;&#x153;No matter how good or bad your life is, wake up each morning and be thankful that you still have one!â&#x20AC;? I am first Dahn Black Belt (JKN) in Korean Traditional Martial Arts. I love to ride my Harley-Davidson motorbike. I like Apple Computers & Gadgets, Blues and Jazz. I am married with five children. I speak fluent English, Estonian, Swedish, Finnish and some Russian. You can find more comprehensive profile via my LinkedIn page and also follow me on twitter @kardiostarltd. Toomas Explains here about his Medicolegal work: I work as an independent medico-legal expert. I am interested in Cardiological issues related to Clinical Negligence and Personal Injuries. I have worked 50-50% for claimants and defendants. My waiting time for the next Medico-Legal appointment is one to two weeks. Report completion time is 3-6 weeks depending on the complexity of questions and issues. I subscribe to the Medical Law Review and keep myself up to date with the Civil Procedure Rules. To ensure the best practice as an expert, I have attended: •	The Workshops arranged by Lynden Alexander and Giles Eyre via Professional Solutions Learning and Development at 12 Bloomsbury Square, London •	Successful Communication at Experts’ Meetings & Preparing to Give Oral Evidence in Court 20 Jan 2017 •	Advanced workshop in Writing Expert Reports 19 Jan 2017 •	Medico-Legal Expert Training Courses via SpecialistInfo.com at 218 Strand, London, led by the well known Jonathan Dingle and Judith Kelbie: •	Court Room Skills Course in November 2014 •	Clinical Negligence Medico-Legal Course in November 2014 •	Refresher in Medico-Legal Expert Advanced Training, September 2014 •	Medico-Legal Expert Advanced Training in November 2011 I am a member of the Norfolk and Norwich Medico-Legal Society and The Medico-Legal Society of London. For arrangements and to request my Terms & Conditions and fee estimates for medico-legal work, please use the contact form.